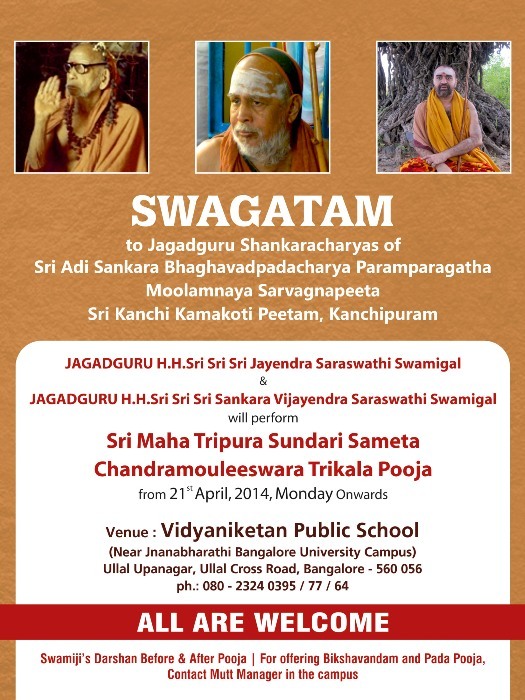 Their Holinesses Pujyashri Jayendra Saraswathi Shankaracharya Swamiji and Pujyashri Shankara Vijayendra Saraswathi Shankaracharya Swamiji will camp in Bangalore and perform the Nitya Chandramouleeswara Puja at the Vidyaniketan Public School, Ullal, near Bangalore University, from 21 April 2014. The morning poojas will start around 9:00 am and evening pooja around 7:00 PM. Concerts and other cultural programmes will be held, and details will be communicated as and when available. Devotees can offer Bikshavandanam and Pada Poojas. Directions are available on Google Maps - please search for Vidyaniketan Public School, Annapurneshwari Nagar, Bangalore. It is about 12 km by car from the City Railway Station. The school is near Bangalore University campus off Mysore Road. According to the BMTC website, KBS 234-C goes to Ullal and from the last stop the school would be about a 15 minute walk From KBS you can take 235-L to Bangalore University and AS-6 to the school or Bus Route 35 to Sirsi Circle and 235-A to the school. The Yatra commenced early on 20 April and after performing the day's puja at Kalavai in Tamilnadu, Their Holinesses left for Bangalore in the afternoon.